It seems that one of Fortnite’s most sought-after skins is finally on its way back to the item store. Dataminers claim to have determined that Skull Trooper will be available to purchase again some time soon. Skull Trooper is up there with some of Fortnite’s earliest skins. The game’s Save the World mode launched in July last year. By late September, developer Epic Games had cashed in on the success of PlayerUnknown’s Battlegrounds, and released Fortnite Battle Royale. That was obviously just days before the spookiest month began, and Fortnite’s first Halloween period was marked by the arrival of Skull Trooper. According to FortniteIntel, the skin, which hasn’t resurfaced in the store for almost an entire year, is officially on its way back. Dataminers have discovered an item store rotation featuring both Skull Trooper and some spooky Back Bling – Ghost Portal was datamined months ago, but is yet to appear in the game. Given that Halloween is getting ever-closer, it’s likely that the two items will show up in the store pretty soon. 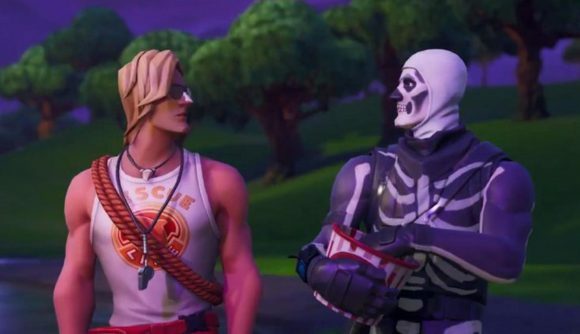 Epic has already teased the skin’s return – Skull Trooper featured in Fortnite’s Season 6 trailer – but this is the closest we’ve come to definitive proof of his arrival. Dataminers have also discovered a bunch more skins likely tied to the game’s Halloween festivities: Scourge and Plague sound like male and female zombie skins, while Hollowhead and Squashman are pumpkin-themed cosmetics. Elsewhere, it looks like Skull Trooper is getting a female counterpart – there’s evidence of a ‘Skull Ranger’ skin in those datamined files. Other Fortnite Halloween skins include some distressing scarecrows (complete with a T-pose emote. Across the map, celebrations have started, with ghosts and giant spiders being deployed across Pleasant Park and Tilted Towers – expect things to get even spookier as we get closer to October 31.